In April, the north end of my driveway bed is anchored by the fragrant rose flowers of the evergreen Arabis caucasica ‘Compinkie’ while the south end is anchored by the white flowers of Arabis caucasica ‘Snow Cap’. The leaves of Arabis are soft and fuzzy. The flowers stay in bloom for most of the month and the very short foliage remains as a skirt in front of other perennials and flowering shrubs for the rest of the growing season and through the winter. There is one other cultivar, ‘Spring Charm’, another rose pink but this one is much more compact. If you want to use Arabis as a groundcover, which I usually do, ‘Compinkie or the straight species will be the one for you. I love the variegated foliage of ‘Variegata’ but, sadly, after about five years, the variegated leaves begin to revert to all green. All of the cultivars benefit from a bit of shearing after bloom if you want a neat look. Most of the time, I just don’t get around to it. They all grow four to six inches in height when in flower but the foliage is only two inches high. Zone hardiness is not a problem in Ohio, extending from zones 4-7. Full sun and excellent drainage are musts for this perennial. Once established, it is drought tolerant and ignored by the deer and rabbits. I use Arabis in several different design configurations. 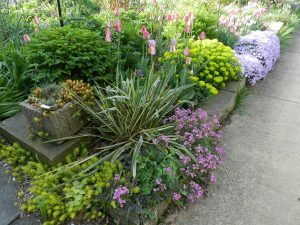 Although you might not immediately think of pairing it with Euphorbia polychroma, the bright pink Arabis and the strong yellow flowers of the Euphorbia really add some zing to the spring garden. 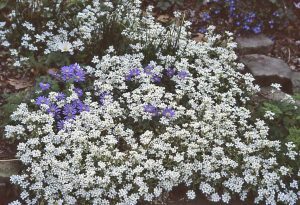 This combination could be softened with the addition of the pale lavender of Phlox subulata. 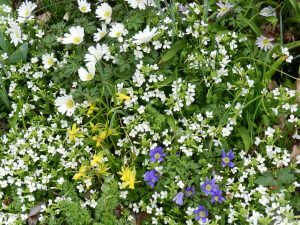 A more conventional combination is the white flowers of Arabis caucasica, the pink and white flowers of Tulipa ‘Lady Jane’, and the blue flowers of Anemone blanda and one of the early blooming Narcissus like ‘Mary Gay Lirette’. I’m sure you won’t have any problem finding a place in your landscapes and gardens for Arabis and now is a great time to plant it.